LONDON Financial markets have been rocked Monday by fears that the U.S. government was heading for a shutdown and renewed political instability in Italy. Despite a raft of economic news due around the world this week, the focus of attention will likely remain on developments in Washington and Rome. In the U.S. capital, lawmakers face a deadline of midnight Monday for agreeing a compromise budget deal that will avert the first government shutdown since 1996. A failure to do so could see essential federal services shut and place hundreds of thousands of staff on unpaid leave. Ratings agency Moody's has warned that a shutdown would knock 1.4 percent off the U.S.'s annual gross domestic product. Meanwhile, in Italy, Premier Enrico Letta faces a confidence vote on Wednesday after ministers from Silvio Berlusconi's center-right bloc pulled out of the five-month government. Though Italy hasn't needed a financial bailout like other countries that use the euro, such as Greece and Portugal, it has high debts that have compelled successive governments to instigate wide-ranging economic reforms. The political uncertainty only adds to concern that the reform program will slip. On the verge of a government shutdown: Now what? "If investors had been hoping that common sense would prevail over the weekend, in either Italy or the U.S. for that matter, then they would have ended up sorely disappointed," said Michael Hewson, senior market analyst at CMC Markets. "Given the protagonists involved in events either side of the Atlantic any other outcome, would probably have been wishful thinking and so it has proved." Given those uncertainties, investors are edgy at the start of a potentially big week on the economic news front, with the data flow scheduled to culminate Friday with the U.S. nonfarm payrolls report for September. A U.S. government shutdown would incidentally cause the postponement of the payrolls release, providing markets with a further uncertainty in the run-up to the next policy meeting of the Federal Reserve. In Europe, the FTSE 100 index of leading British shares was down 0.7 percent at 6,465 while Germany's DAX fell 0.9 percent at 8,582. The CAC-40 in France was also 1 percent lower at 4,144. Unsurprisingly, Milan's stock exchange was faring worst, trading down 1.6 percent at 17,368.52. And in another sign of investor unease, the yield on Italy's benchmark 10-year government bond was up 0.08 percentage points at 4.50 percent. Wall Street was poised for fairly hefty losses when it opens for trading later, with Dow futures down 0.8 percent and the broader S&P 500 futures 0.7 percent lower. The mood was downbeat earlier in Asia as well. 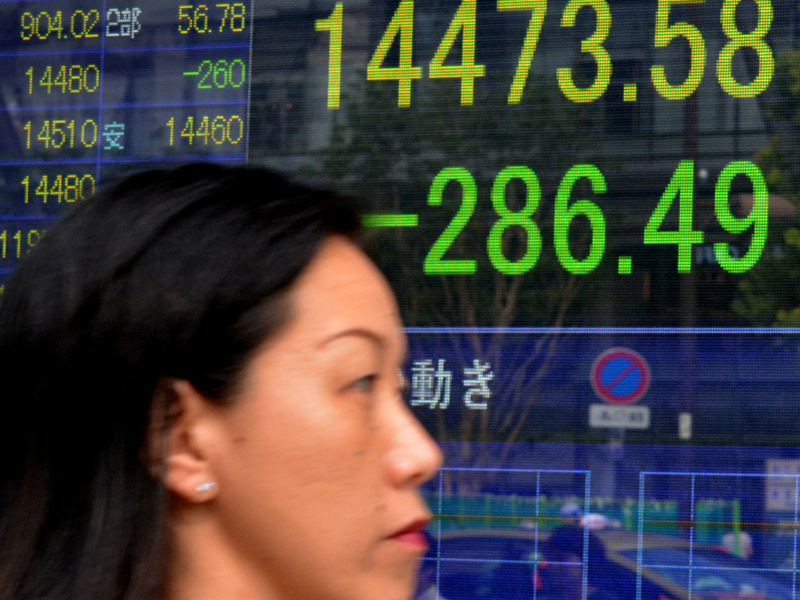 Japan's Nikkei 225 stock average, the region's heavyweight, led the way down, closing 2.1 lower at 14,455.80. Among others, Hong's Hang Seng index was down 1.5 percent to 22,859.86 while South Korea's Kospi was trading 0.7 percent lower at 1,074. How markets end the day will largely hinge on developments in Washington, with the deadline looming. Recent history suggests that some sort of deal may end up being cobbled together between the Republican-dominated House of Representatives and the Democrats, who control the Senate as well as the White House. "As we've seen in the past, the months leading up to the deadline are simply seen as an opportunity for both sides to gain political points, while making a villain out of the opposition," said Craig Erlam, market analyst at Alpari. "It's only in the final 24 hours that any actual progress tends to be made. We can only hope that this is what we're seeing again." In other markets, the euro was 0.1 percent lower at $1.3503 while the dollar fell 0.4 percent to 97.86 yen. The price of benchmark New York crude was $1.17 lower at $101.70 a barrel as investors fretted about the impact on the U.S. economy and the consequent impact on energy demand.